At this time of the year, Leh is teeming with tourists from abroad. 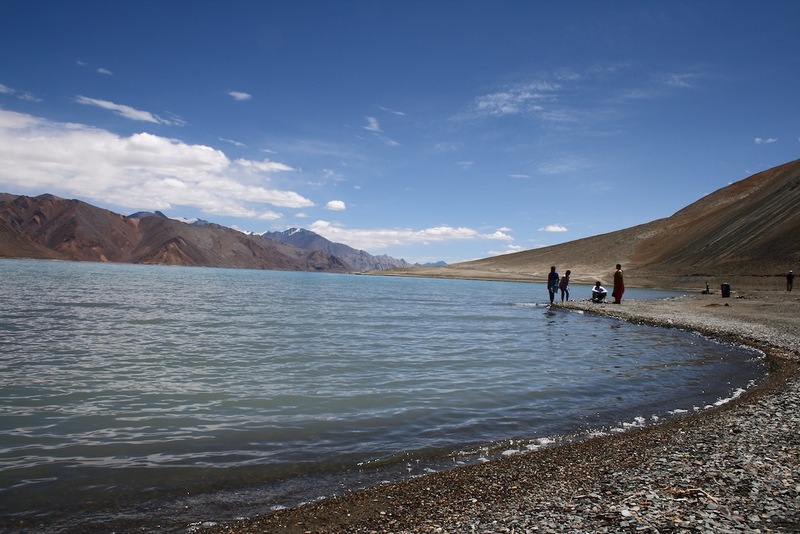 Most of the visitors use Leh as the base for trekking on to nearby mountains. Very few Indian tourists reach here. Come on Indian adventure lovers! 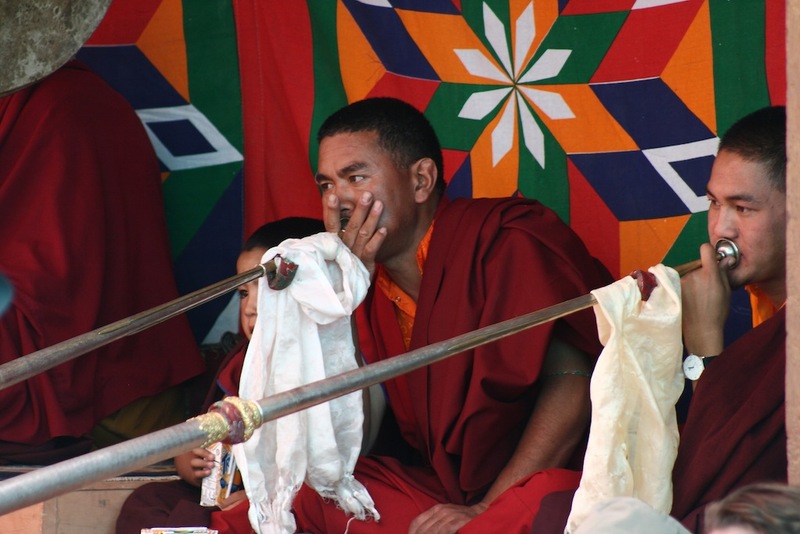 Native tongue of local people is Ladakhi (similar to Tibetan, they say). We learnt just a few words - Jullay means Hi! (locals usualy just say Ju for short), Tso means lake and La means mountain. That was easy - so many Tso and La around ;) . Leh caught me a bit off guard. I had heard of it being a high altitude desert, but I had never really seen one. My highest altitude experience was Switzerland, but I had seen it as quite green. Leh was really dry, the days were warm, the sunshine was piercing and vegetation was not abundant. I was thinking, will the Antartica be something similar? Annual precipitation at Leh is just 90mm, while that of Antartica is 200mm. Since it never rains much, people build mud houses with flat roofs and unprotected walls. A few hours of mild rain damages the walls and severe rain can cause real havoc (like what happened last year, 6th August 2010). In fact the day we reached Leh was the very same day of last year when rains wrecked havoc in Leh. Most of the population in the city is into tourism. There are abundant apple and apricot trees all over the city. At the outskirts, farmers grow (can grow) only one crop per year. 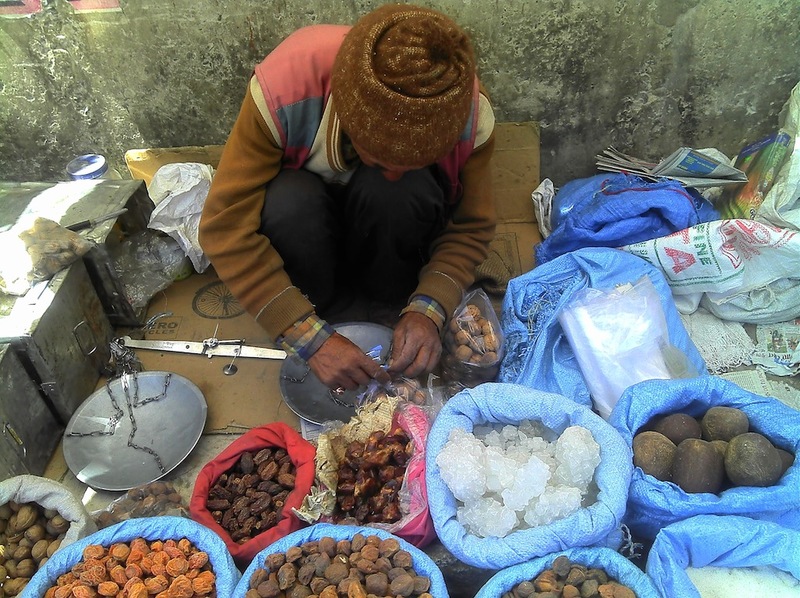 Local farmers sell both fresh and dried fruits and vegetables on the streets near the city taxi stand. Clockwise from top left: A residential street, Yummy local rista (meatballs), An interesting handicraft shop, Dry fruits vendor. 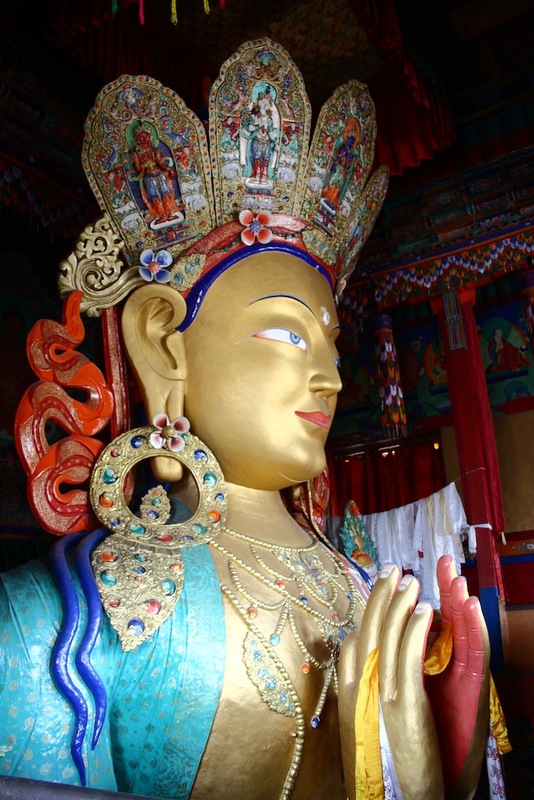 We spent few days in and around Leh, visiting the various monasteries and palaces in Leh. 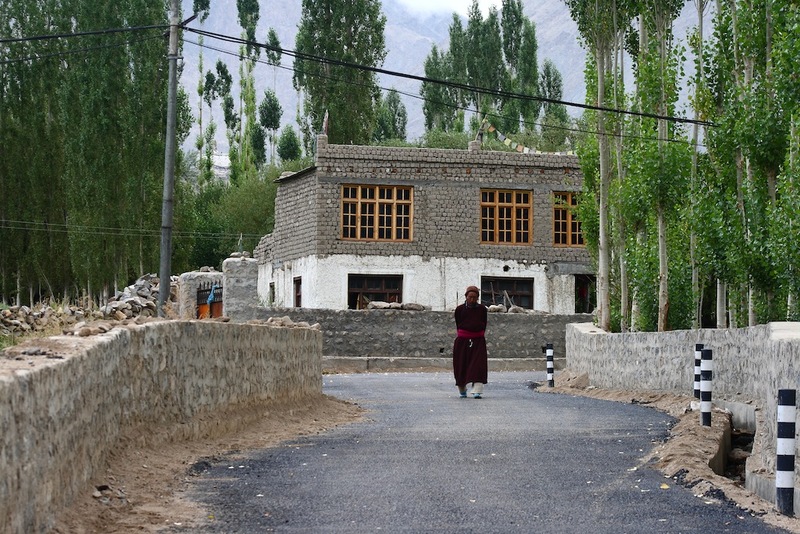 Shey, a city just before Leh on the Manali-Leh highway has an ancient palace - the Shey Palace. 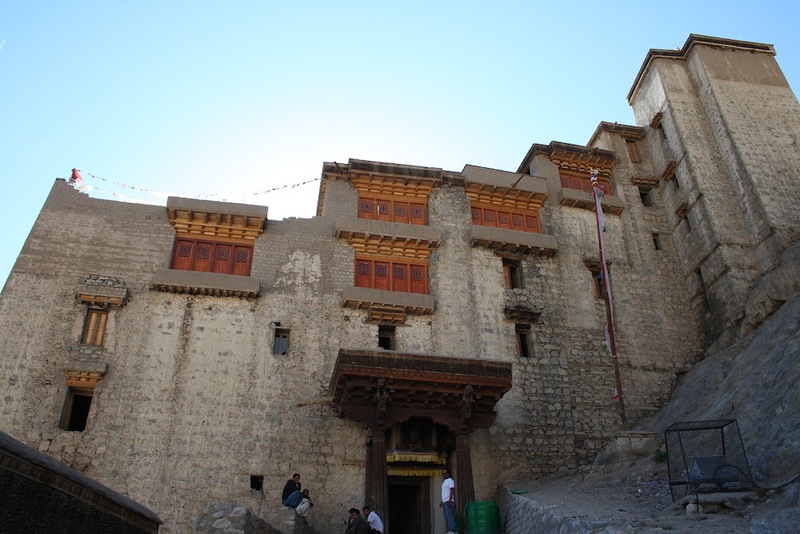 The palace was the summer retreat of the kings of Ladakh and also has an adjacent monastery. 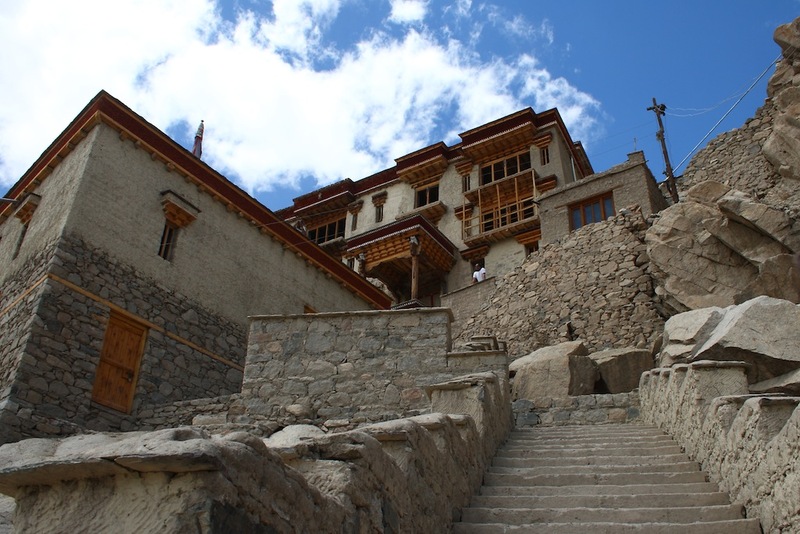 Further down the road, there's an even bigger and more beautiful monastery, the Thiksey monastery. Bottom: Buddhas at Thiksey monastry and Sheh Palace. 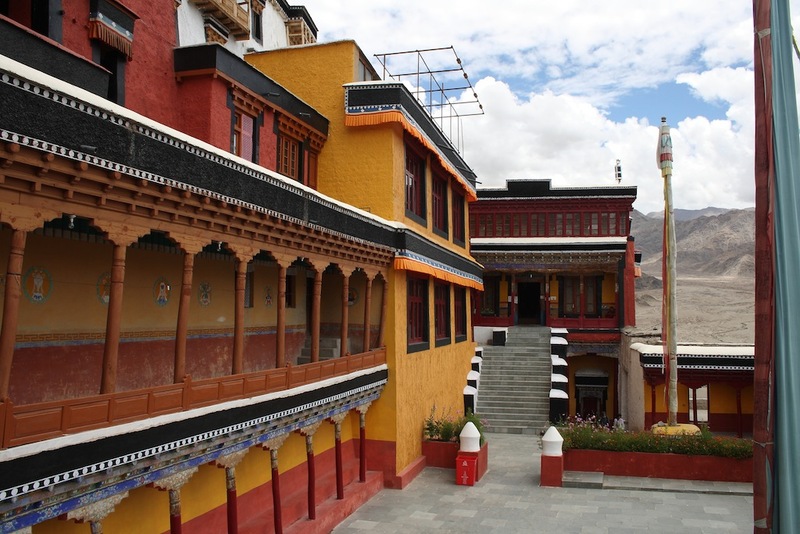 Leh has the Leh Palace used by the erstwhile kings of Ladakh - the Namgyals. The palace was in the process of being renovated with newly plastered walls and wooden doors & windows. 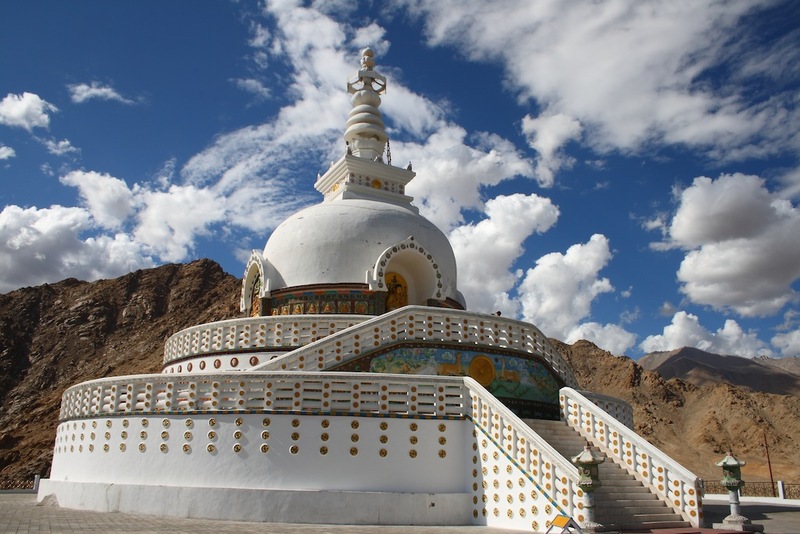 Then there's the Shanti Stupa build by Japanese and Ladakhis recently in 1991. The wikipedia article on it has some explanations of the various murals on the stupa. 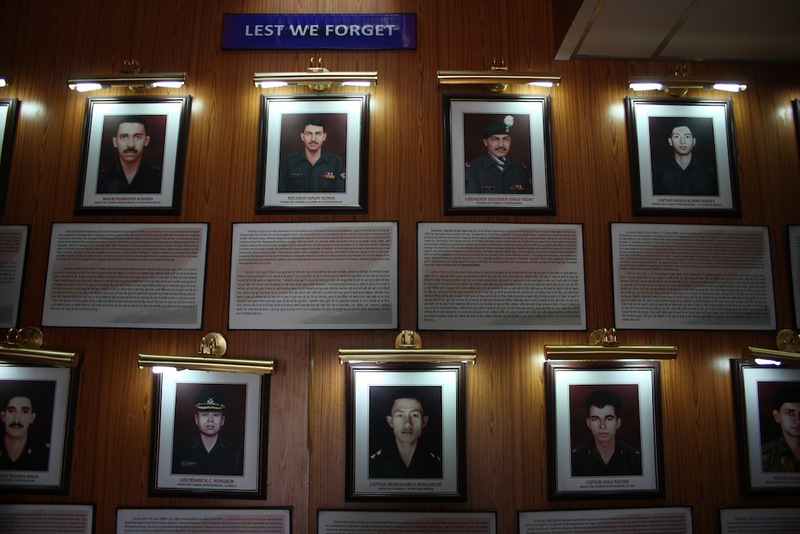 Near the city there's an Indian Army hall of fame showcasing glory of the Army in wars fought. The most recent war was the one fought at Kargil against insurgents from Pakistan. 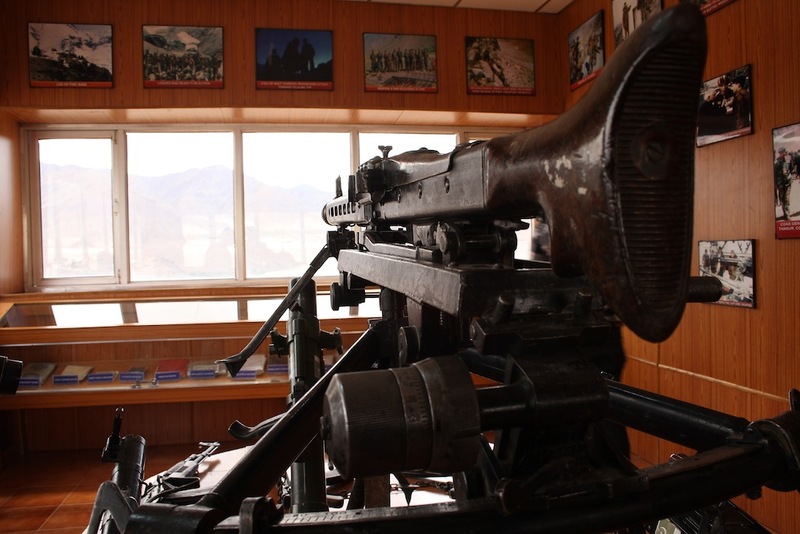 There were exhibits of weapons, ration cards, Pakistani army ID cards seized from the opposing side. It was an eerie feeling holding them in our hands, while knowing that their owner probably died in the war holding the same weapons. There was a very emotional letter on display, written by an Indian soldier to his father the day before going to fight in the front, fully aware of the situation and knowing that it might be his last day. In fact, sadly, it was. 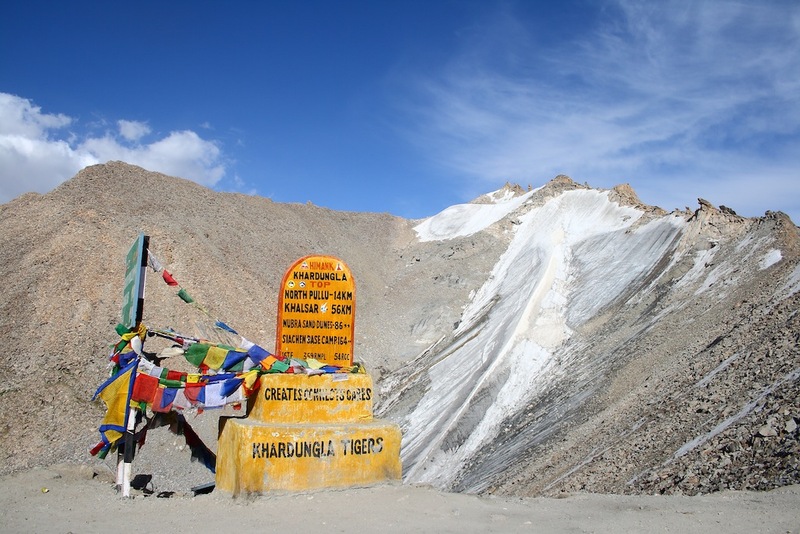 We drove up to the mighty Khardungla Pass, the highest motor-able pass in the world. The Siachen border base camp is just around 150km from the pass. Indian army trains and acclimatizes its soldiers at Khardungla (North Pulu) before they go on to the Siachen border. 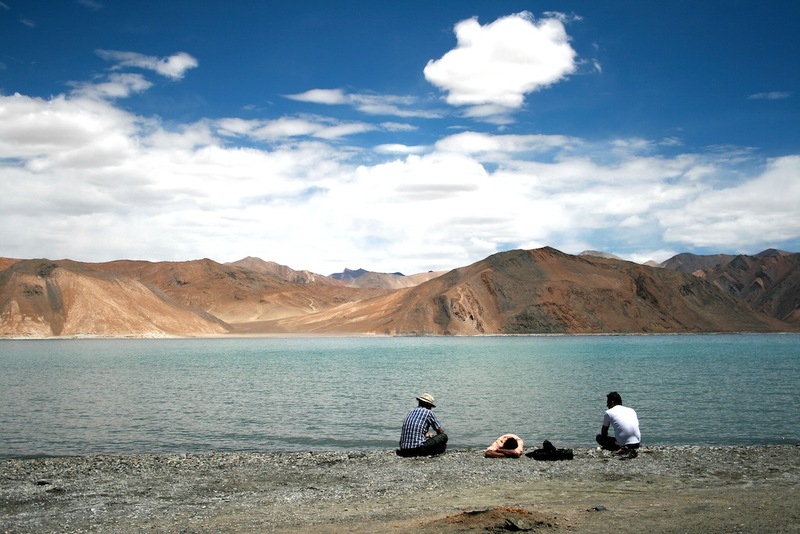 The most beautiful sight was to be seen at the Pangong Tso (lake). It is a huge lake, most of it in Tibet, with pristine blue-green waters. It is a sight only to be experienced which no photograph can match. It recently became famous after being picturized in the popular Bollywood movie, "The Three Idiots". There were only a few tents there to stay, and a couple of hotels that serve lunch and snacks for the day tourists. 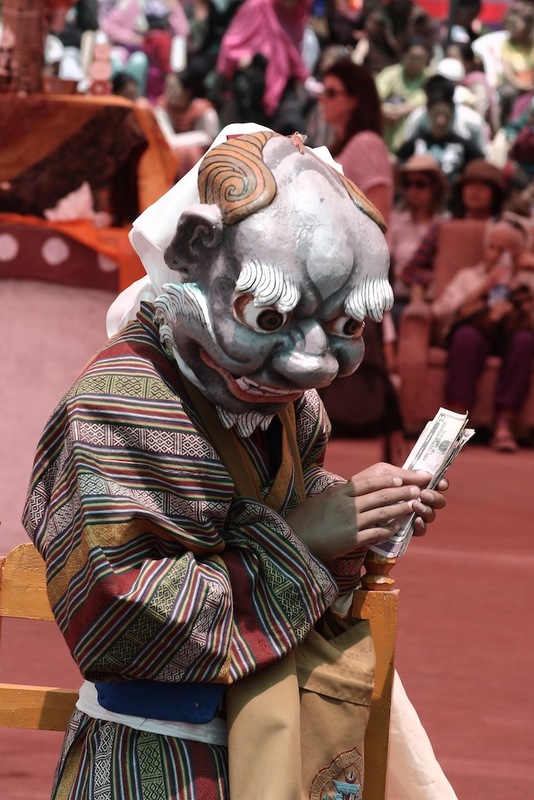 One of the days we attended a religious festival at one of the monasteries (the Hemis monastery). 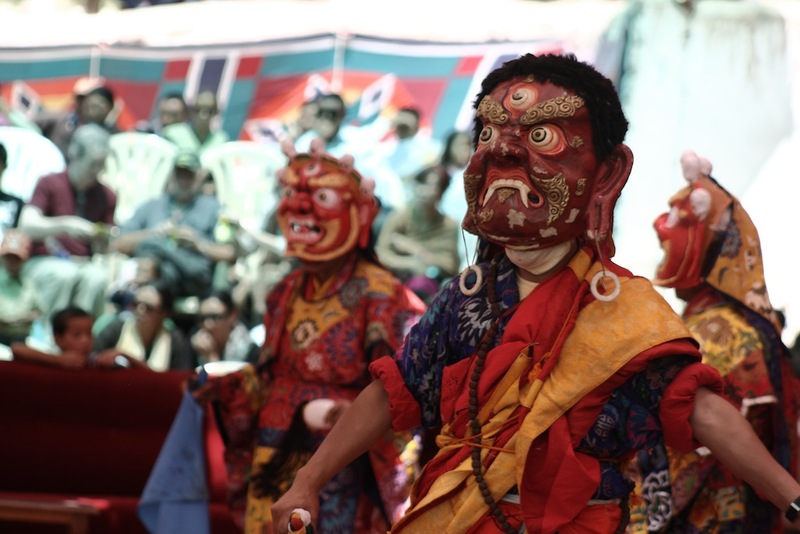 Though we could not understand much of the ceremony, the dances were interesting to watch. There was a significant local population there as well, particularly the elderly with their full traditional dresses on this occasion. And one more evening we slipped into another nearby hotel to secretly watch a traditional dance demonstration that the hotel had organized for its guests. The announcer there fortunately explained a bit about the dance and the occasion in which it is performed, and it was a bit more understandable. 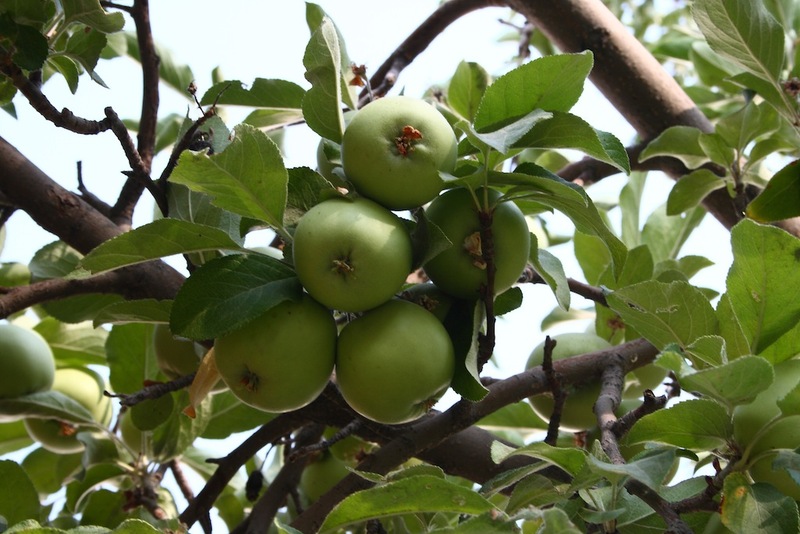 Apple and apricot trees are there in many back yards of houses in the city. Some of the apples were turning red during our stay. The place we stayed had both apricot and apple trees and the people managing the guest house were kind enough to let us have them often. 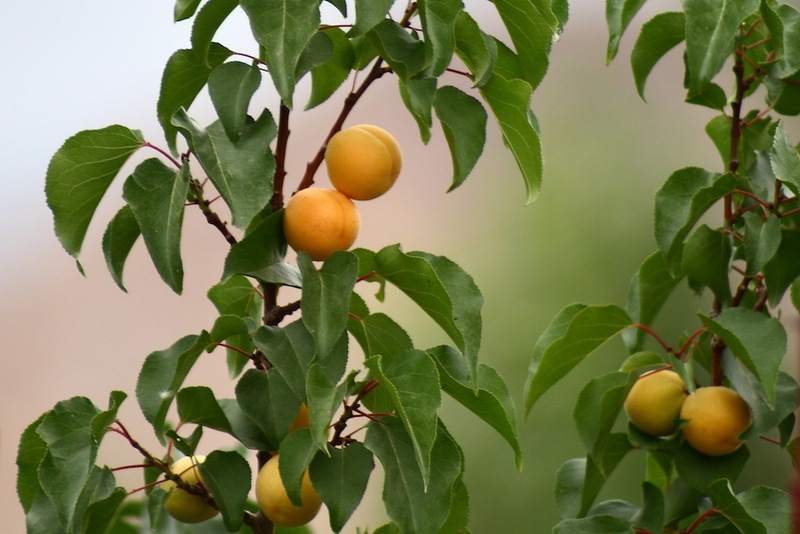 Apricots varieties came in many colors - yellow to deep red! 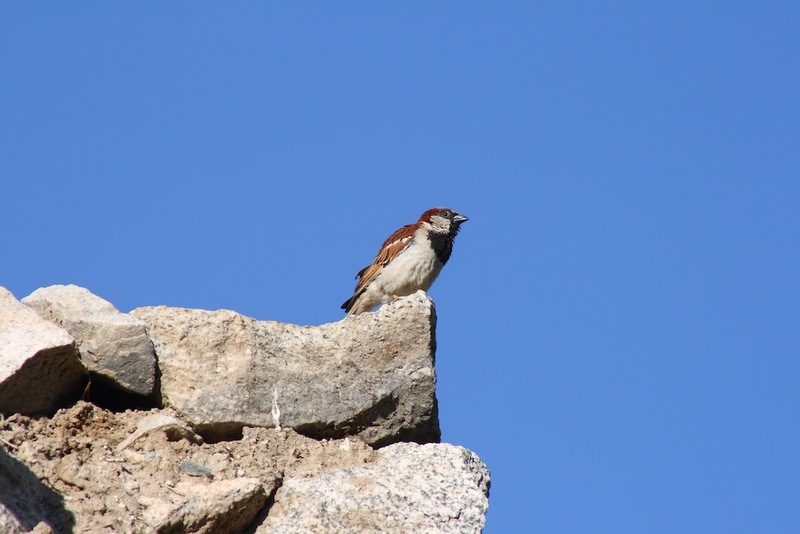 Walking in the streets of Leh early in the morning is relaxing with birds chirping all around you. Sparrows and robins abound. There are many more I could not identify. 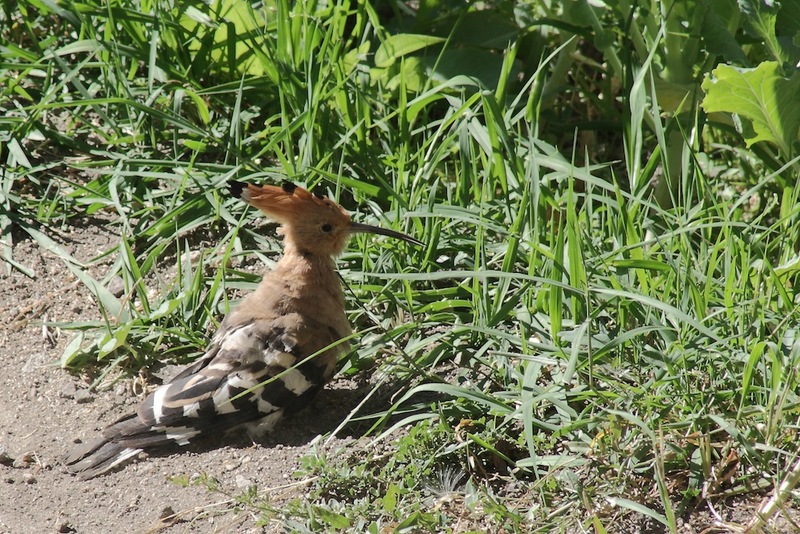 There was one interesting bird with a crown that I gathered later was called the Common Hoopoe. 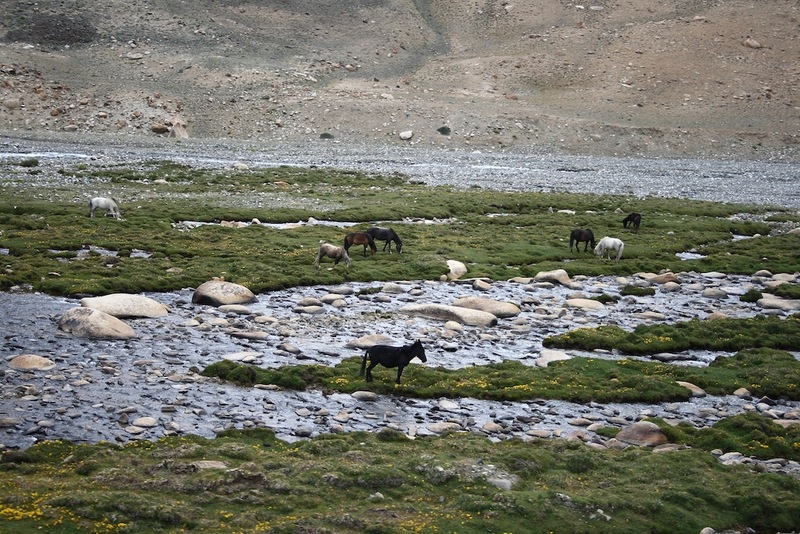 Among animals, horses and donkeys can be seen in abundance by the road side. There are apparently snow leopards high up in the mountains and they sometimes come down till some of the passes during the winter. The Dzo is another animal seen. 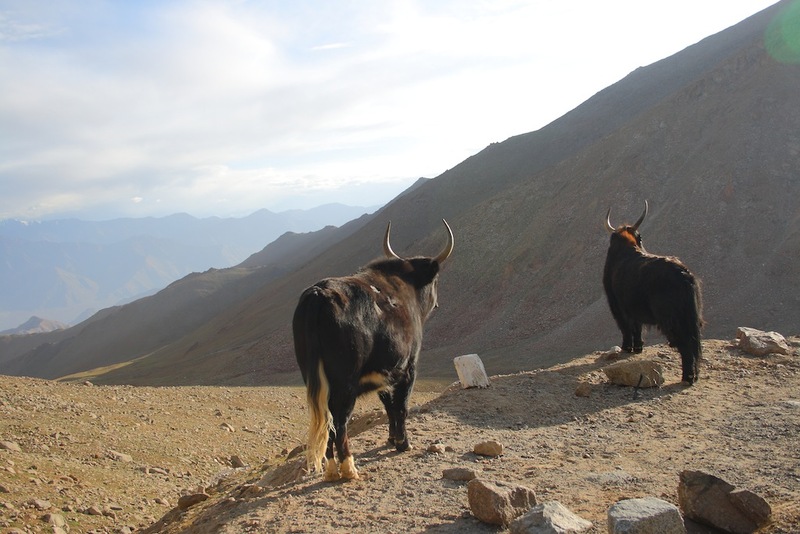 It is a cross between Yak and the domestic cattle. The male Dzo is used in fields, and females for milk. 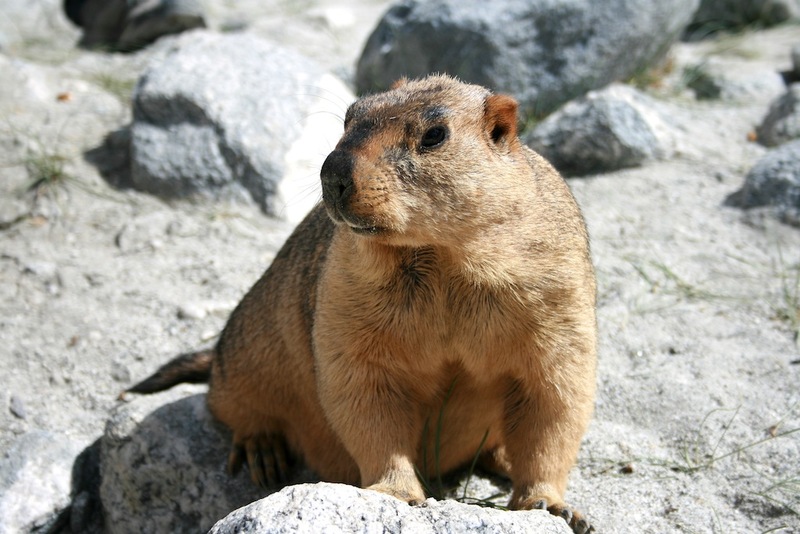 Another curious animal found here is the Marmot. They look like cute giant squirrel and live in burrows in the ground. Farmers know them well as they sometimes dig up and damage crops! The ones we met by the road side near Pangong lake stood up on their hind legs and took a piece of bread from our hands. 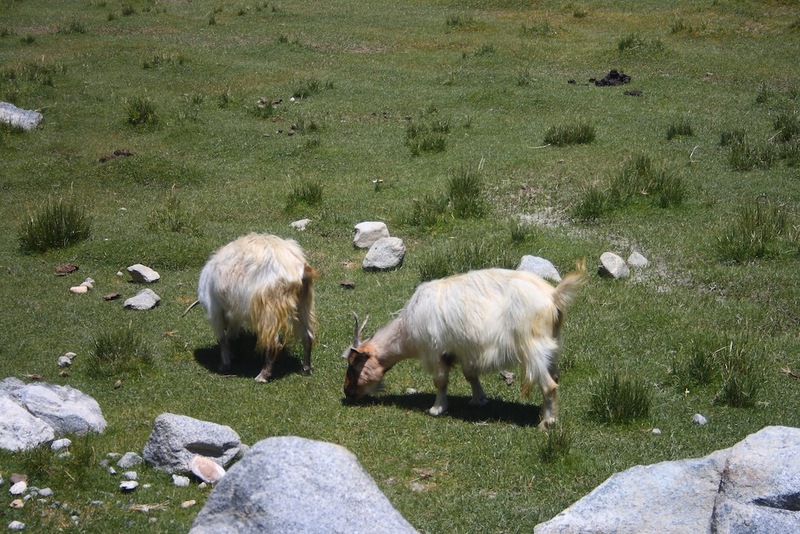 We also saw the Pashmina goats, from whose wool the famous Pashmina shawls are made. The Leh airport is small but looked efficient and secure. In spite of the crowd, there was not much queue. And my post won't be complete unless I mention the beautiful view of the Himalayan peaks we saw from the flight on our way back from Leh to Delhi. 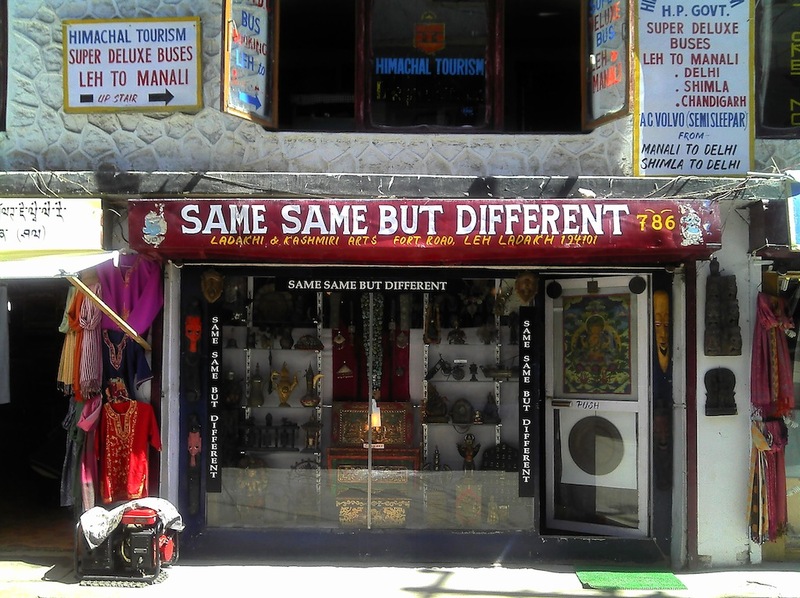 Another good bike rental at Manali: Hardev Motors. Contact Mr.Sonu Rajput. Bike rental we used at Leh: Ladakh Yeti Travels. Contact: Tsewang. Tel: +91-9622997541, +91-9419551849. They can also organize local adventure sports and sight seeing. 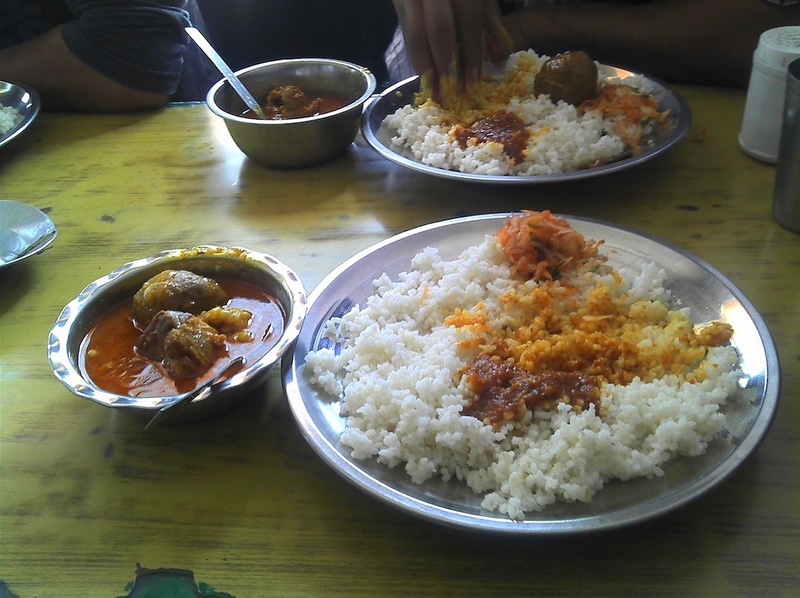 Local cuisine to try: Kashmiri (we tried Rista and Kabab), or Tibetan (we tried Thukpa, Thenthuk and Momos). I used a phone app called "Trip Journal" to keep my travel notes and pictures organized. I found it useful! A notepad at your fingertips to record thoughts, emotions, information any time. Disclaimer: The above links and contact details are just what we used. We did not have a bad experience with them, but there may be better providers. I do not endorse them in any way beyond this. Great explanations, really complete information about the place including birds and animals and such beautiful images - couldn't resist to click on each image to see the larger versions. 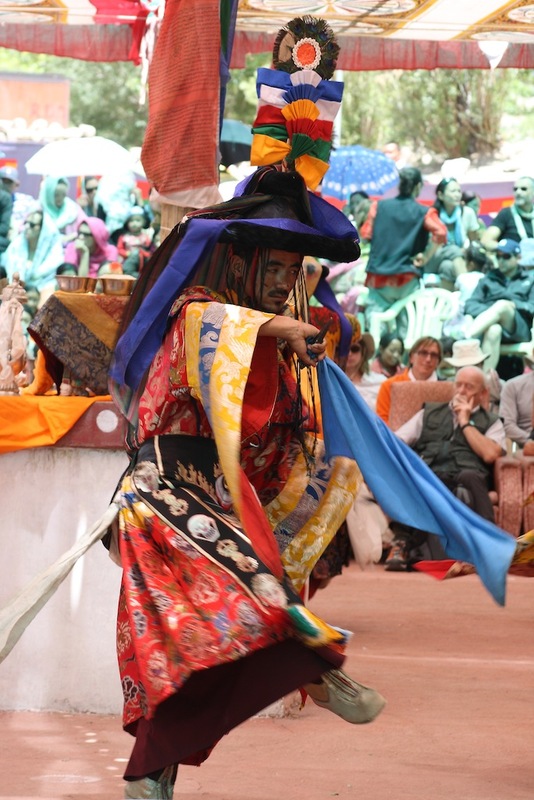 The monastery festival images, the lake images, the shanti stupa .. really amazing. Thanks. Brought back some fond memories of my trip to Ladakh last year. Went with a group called Journeys With Meaning, run by a guy called Vinod Sreedhar. Life changing experience! You've got a useful post here, I've bookmarked it. Thank you! By the way, here is my IndiVine post. Check it and if you like it then please Promote it too there on IndiVine. @sush @Sunil Glad that you enjoyed this. But there's so much more that can only be experienced by being there. Do visit there if you get a chance! @Shesha @Acropol It sure is an intense experience. It would be even more intense if you were there last year during the floods. @Shaan Yes, even deserts can be beautiful! Thanks for your appreciation. AHH!! I had goose bumps as I read your post. I saw all your images in enlarged mode! BEAUTIFUL captures. Would love to visit Leh. Will bookmark your page for future reference. I wanna go back and read your post again. Seems to be a great adventure which a trip to Ladakh is always is. Nice to read about your account which is topped with some very lovely pictures. @Spicy Sweet, @jitaditya, @Dheeraj Thanks! @Mayank Glad that you found this useful! I use a Motorola Defy - a mid range Android, rugged build, decent size, average camera. Used it to take quick snaps (while riding & stuff like sign boards...) and to take notes. Most pics here are not from my phone. Hats off! This is a fantastic bit of info you have put down. Definitely better than ANY travel brochure going around. Pl let me know where the "rista meal" photo was taken. (the retaurant/place). Seems like a dhaba place which I really fancy for genuine local food. I am planning a trip to Kashmir/Leh around 12th may. I am thining if I can get reasonable 'wazwaan' in or around Leh, I might as well drop Kashmir & make it a extended Leh trip. Even the Srinagar Leh Highway opening may be a big ucertainity by May 15th. Thanks Poras. Glad that you found this useful. The Rista Meal was a small shop somewhere near the Leh Post Office. But I'm sure you'll get them elsewhere as well. Unfortunately, I had not found a place the served the full wazwaan. Places away from the main market place are quieter and let you experience the serenity. Make friends with the staff of the place you stay. While on the move, occasionally drop into the smallest of places for food and you may find many surprise dishes. On twitter @devilonwheels gives updates road conditions pretty regularly. All the best for your trip! And do update us with your experiences. It seems Leh will be on hold till next year. The air bookings are all packed till July! So will probably have to settle for 6 Days of kashmir instead. But i'll remember your tips for Leh. Can you please let me know , How much did the complete trip cost you? We are planning to visit leh in June. So can you please help us with the details regarding the pre-booking of bikes, payment, cost of renting the bike @ leh etc. Any info from your side will be very helpful. our trip cost us around 40K per head, from Delhi - Manali - Leh and back to Delhi. We had pre-booked bikes from Manali. But there are many bike rentals at Leh and if you get in touch with any of them (probably through the contacts I have mentioned above), you can talk to them. Land up at the bike shop a day or two before your trip so that you get to choose and keep good bikes. In any case, just chill and take things as they come. That's the best way to enjoy there. One more thing which I wanted to ask you was ,Why did you drop off the bikes when you had reached Leh and rented another bike in Leh. Cant you just continue with the same bikes hired from Manali and once the complete trip is over then leave the bikes in Leh. That's because the charges for renting bikes for Manali-Leh crossing was higher that that for use within the city. That's understandable as wear and tear is much more during the crossing. The bikes also typically need a round of repairs after the crossing. For example, one of our bikes had a severe short circuit on the way and much of the wires had gotten burnt out. Others had broken spokes and worn out clutch plates. Since we hadn't planned to ride back to Manali, it was cheaper to send off the bikes and use local ones.